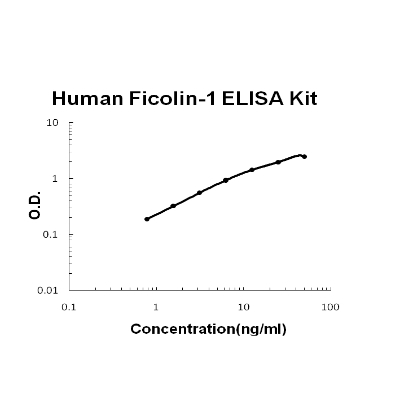 Sandwich High Sensitivity ELISA kit for Quantitative Detection of Human Ficolin-1. 96wells/kit, with removable strips. Peripheral blood leukocytes, monocytes and granulocytes. Also detected in spleen, lung, and thymus, may be due to the presence of tissue macrophages or trapped blood in these tissues. Not detected on lymphocytes. .
Secreted. Cell membrane; Peripheral membrane protein; Extracellular side. Found on the monocyte and granulocyte surface. Extracellular lectin functioning as a pattern- recognition receptor in innate immunity. Binds the sugar moieties of pathogen-associated molecular patterns (PAMPs) displayed on microbes and activates the lectin pathway of the complement system. May also activate monocytes through a G protein-coupled receptor, FFAR2, inducing the secretion of interleukin-8/IL-8 (PubMed:21037097). Binds preferentially to 9-O-acetylated 2-6- linked sialic acid derivatives and to various glycans containing sialic acid engaged in a 2-3 linkage. .
Ficolin-1, and also commonly termed M-ficolin is a protein that in humans is encoded by the FCN1 gene. It is mapped to 9q34.3. The ficolin family of proteins are characterized by the presence of a leader peptide, a short N-terminal segment, followed by a collagen-like region, and a C-terminal fibrinogen-like domain. Ficolins have a crucial role in defense against pneumococcal infection through the lectin complement pathway. Ficolin 1 is predominantly expressed in the peripheral blood leukocytes, and has been postulated to function as a plasma protein with elastin-binding activity.